The reason your favorite cartoon or movie character hasn't appeared in Macy's annual Thanksgiving Day Parade isn't necessarily because they're not popular, it might be that crafting an inflatable likeness has just been too difficult. 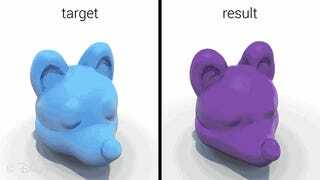 But to ensure no fad gets left out, the folks at Disney Research have developed special software making it easy to turn any 3D model into an inflatable balloon without it getting deformed or bloated in the process. Once a 3D model has been imported, the software allows a designer to specify areas that should be treated as seams. Using cloth physics and something called "tension field theory" the software can simulate what a 3D model would look like inflated, allowing the designer to test revision after revision until it looks right.